This Jamaica Defence Force has evolved and expanded from its rudimentary beginnings in the post colonial/ independence era, with the terrestrial focus of the Jamaica Regiment (Jca Regt) and Jamaica National Reserve (JNR), to the present day fully joint operational multi-domain construct. This evolution has been driven by the ever-shifting paradigm of the contemporary threat environment and also consistent internal analysis in order to ensure that the JDF is able to respond to most, if not all, threats to domestic and regional security. Significant and evolving activities in the global security environment have led to an increase in the size and commensurate structural reorganisation of the JDF. In that regard the Force is moving forward, in keeping with international doctrinal and military best practices and strategic analysis; in order to revamp its joint strategic headquarters, overall command structure and to also expand and rationalise its domain focused line entities. This revamped structure sees the Force increasing in size from a North Atlantic Treaty Organisation (NATO) standard Reinforced Brigade (Rein Bde) structure to that of a NATO standard combined arms Division (Div) structure. This combined arms Div structure is achieved through the revamp of the Joint/Div headquarters and the creation of four Brigade formations in addition to the Regimental size Jamaica National Service Corps (JNSC). 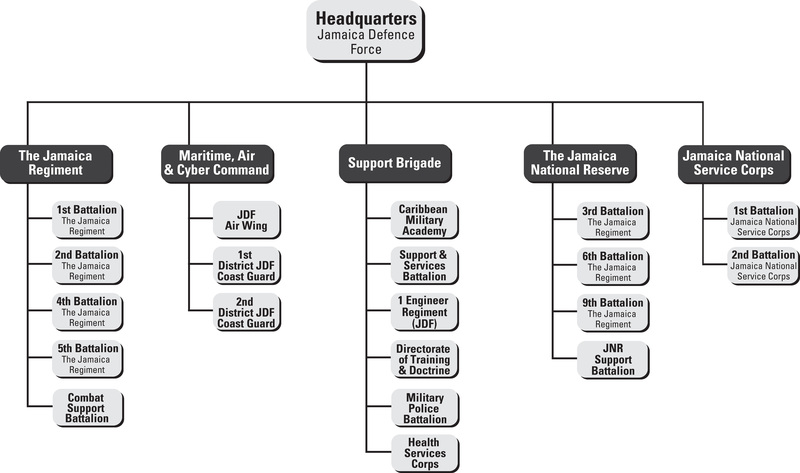 These four (Bde) formations; three Regular Force (The Jamaica Regiment (Jca Regt), the Maritime, Air and Cyber Command (MACC) and the Support Brigade (Sp Bde)) in addition to an expanded Jamaica National Reserve (JNR) will task organise existing units along with the proposed new units/entities to provide the necessary operational oversight and management of the Force’s capabilities in the land, air, sea and cyber domains. This overarching structure facilitates a greater focus by the Chief of Defence Staff and the Joint staff on matters of strategic importance to the Force, nation and region at large.